Fallon is located in western Nevada, less than an hour drive from Carson City and Reno. Fallon receives lots of traffic, as Fallon is at the junction of US Highway 50 and US Highway 95. As such, significant traffic flows through town on the way to Reno, Carson City, Interstate 80 and Las Vegas. Much to the surprise of most people who first pass through town, Fallon is located in an area that has extensive agricultural activity despite the very arid surroundings. The Truckee River supplies the water to irrigate more than 50,000 acres of land, with alfalfa the primary crop grown. Despite the traffic that passes through town, Fallon is more than a traveler’s rest stop. 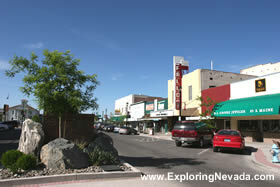 With a population of over 8500 people, Fallon has a sizable downtown area. The principal employer in town is the large Naval Air Station Fallon located just outside of town. The NAS Fallon is the premier air-to-air and air-to-ground training facility for the United States Navy. Several advanced training schools for US Naval pilots are also located at NAS Fallon, including the Fighter Weapons School, the Navy Rotary Wing Weapons School and the Carrier Airborne Early Warning Weapons School. Additionally, training for the Navy SEAL Combat Search and Rescue also occurs at NAS Fallon. With all the naval aviation training happening at NAS Fallon, it should not be a huge surprise that the skies can be a busy place at times. Indeed, the last time I drove down US Highway 50 to the east of Fallon, I stumbled across air-to-ground training taking place just a few miles off the highway. Naval jets were swooping down and dropping live ordnance on a hillside, which was fun to watch. Although Fallon is located in an agricultural area, Fallon is reasonably close to a number of scenic drives, including the Desatoya Mountains Scenic Drive and the Walker River Scenic Drive. Other outdoor activities around Fallon include bird watching at the Stillwater National Wildlife Refuge, ATV'ing at Sand Mountain, and fishing at Lahontan Reservoir. Plus, the Sierra’s are just an hour drive away. Owing to the large number of people who pass through town on their way to somewhere else, Fallon is a base for gas and other supplies for people heading out into the desert or the mountains of Central Nevada. Fallon also has many hotels and casinos in town, so lodging is easy to find. If you don't want to spend the funds at a local hotel, the local Walmart parking lot can be VERY popular overnight stays too! I know this from experience, too.